Turn 3GP to MP3 audio files online in a few clicks! Try a 3GP to MP3 Online Converter now or take the batch Tool for more! Get Total Audio Converter to convert whole albums in one go. Keep your files safe, don't send them to the web. *Only this month. Not for resellers. Total Audio Converter supports WAV, MP3, OGG, WMA, APE, FLAC, MP4, AAC, MPC and many other rare image file types files (complete list). Rip CDs to WAV, FLAC, OGG, MP3, AAC, WMA, MPC, APE and other formats with Total Audio Converter! No tech knowledge required. Intuitive interface makes it easy for everybody to be the master of audio conversions. If you do not know what bit rate or frequency to choose the wizard of the program will automatically set the most appropriate. What to combine tracks into one audio file? Total Audio Converter can do that too! Convert MP3, WAV, AAC and many other files in seconds via our foolproof interface with lots of hints for beginners. CNet editor's review: TAC is reasonably attractive and plenty powerful to justify its $20 price. 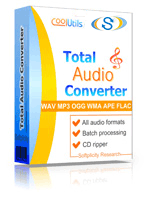 Total Audio Converter converts a lot of rare audio file types like NIST, AU, TTA, MOD, MIDI, XM, PAF, SPX audios. Total Audio Converter can split FLAC and APE files by CUE (split CUE-based FLAC, split CUE-based APE). Price. No hidden costs! Our pricing is clear and concise. Once paid you get all the upgrades for free. Tech support is also free to registered users (sure we will answer all your questions even if you are using trial version of Total Audio Converter). Total Audio Converter can get audio tracks from YouTube videos - just paste the url. Total Audio Converter can be run via command line (get the ready-to-use command line from GUI settings). Softonic Editor: Total Audio Converter is an easy-to-use tool conversion tool with support for a bunch of formats and ability to rip audio CDs. Description 3GP file is most often a video clip recorded by the camera of mobile phones, tablets, etc. It is a media container that is small in size, allows saving video data in MPEG-4 or H.263 inherited from MOV format, and audio data in AMR-NB or AAC-LC. The quality of 3GP videos is low for big displays. This format is used for sharing media data in 3G networks or playing on mobiles. 3GP files can have .3gpp extension. The most of modern desktop and mobile players support 3GP format. Description MP3 is the most popular audio file type based on MPEG-1 Layer III compression. Its lossy algorithm was developed in 1991. MP3 codes the sound almost with the same quality, as CD (16-bit stereo), providing compression in size 1 to 10 from the original WAF or AIFF tracks. The quality of MP3 seriously depends on the bitrate. It can be 128 - 256 kbps. Higher bitrates are also supported, but they seriously increase the file size. It is supported by all modern hard- and software players. Copyright 2003-2019 CoolUtils Development. All rights reserved.